Specify shape of each track and the measurement for each section of track. It may be necessary to fax a rough sketch of your layout so that we can bend the track properly to fit your application. 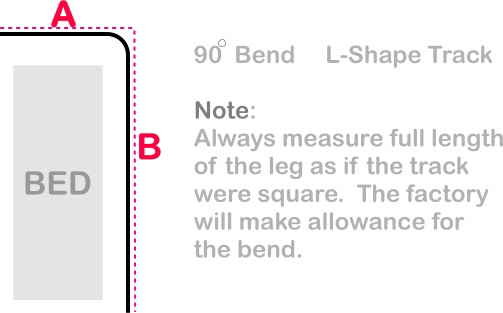 Standard bends are 90 degrees or 45 degrees. Track is curved on 14" radius. Custom bends are available on request. Oversized tracks may be cut for shipping. Proper measurement is critical to ensuring your new cubicle track works for your space. Follow the steps and call us at 1-800-725-3266 if you need assistance.